On Tuesday, April 17 the Boxing Writers Association of America announced its 2017 Bernie Award winners, with the HBO Boxing Insider staff receiving top honors for their contributions to Inside HBO Boxing and From The Vault. Eric Raskin earned first place in the Boxing Investigative Reporting category for his story, "Unrealized: The Story of Ike Ibeabuchi, the Great Lost Heavyweight." The oral history is also available as a podcast. Kieran Mulvaney was recognized in two categories. 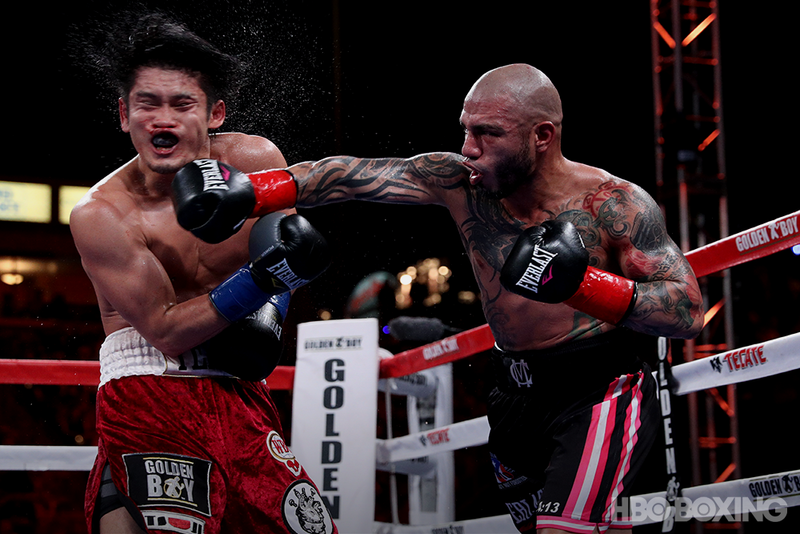 His article "The Last Boxing Days of Miguel Cotto," which went inside the legendary fighter's camp as he prepared for his farewell fight against Sadam Ali, won third place in the Boxing Feature (over 1,500 words). The fight story from the heavyweight championship at Wembley Arena in London, "Joshua Is the New King As Valiant Klitschko Goes Out On His Shield," also won third place, in the category of Boxing Event Coverage. Gordon Marino received an Honorable Mention in the category of Event Coverage for his Inside HBO Boxing piece, The X’s and O’s of Canelo-GGG. Additionally, HBO Boxing Insider Springs Toledo received numerous awards for work that appeared in a variety of publications. HBO Boxing photographer Ed Mulholland received an honorable mention for his entry in the BWAA's Action category of their photo contest, which appears at the top of this article.